Here We Go: A big AE86 week awaits – Garage Dusty Exciting Car Team! It has been a long, long time coming, this Summer freshen up that has stretched into Autumn and verged on a rebuild. But there’s now a blinding light at the end of the tunnel. The last pieces start falling into place this week. Yeah, they’re a little rusty and rough, but at $200 vs $350+ for new ones, they’ll do just fine. 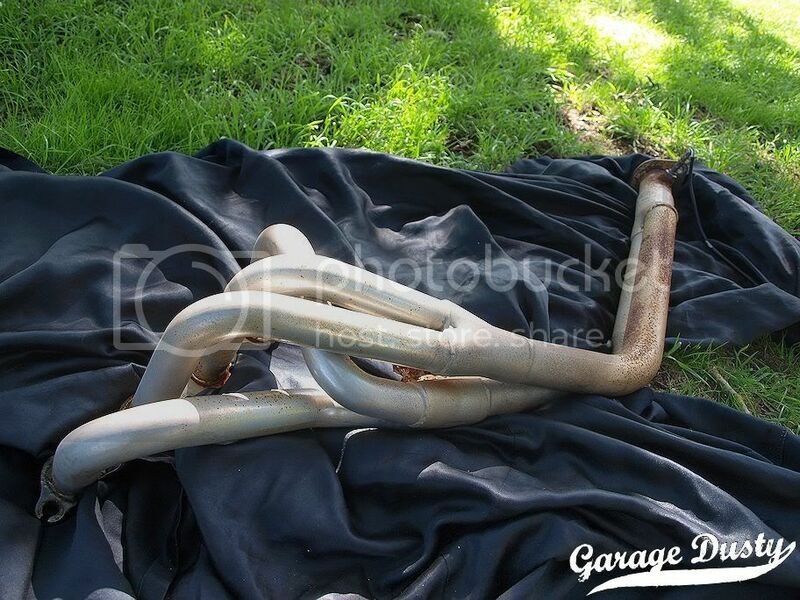 And the rest of the exhaust will sit in the shed as a spare for if I ever need it. They did need a cleanup though. A $17 can of paint and 10 minutes and they look presentable again. 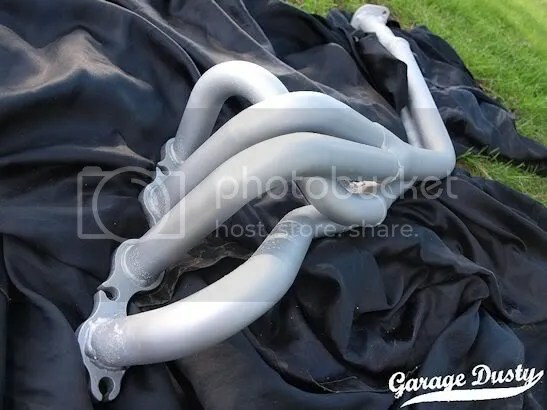 They’re getting fitted up on Wednesday by Carline Mufflers, who did the existing rear section of the exhaust for me when I got the car. Today I had a wheel alignment done for the first time since I bought the car. My new adjustable front end parts made for a frankly undriveable car without professional help, so it was in to Dale at Truline Suspension and Steering for an overhaul. A quick conversation with Dale had us on the same page regarding the usage of the car, and with Dale having set up probably hundreds of cars for BLCC events I took heed of his advice. We’re not running as much caster as I expected at 4 degrees (I was looking at around 7) but Dale has said that if I don’t like how it drives he’ll change it around again. We’re running 2 degrees negative camber at the front, a massive reduction over the old setup, which should help my handling on the short-run stages that the car spends most of its life on by allowing more tyre to touch the road. The car is also running 2mm total toe out. The end result? MASSIVE turn in grip on the street. As in, I will have to get a lot braver before I can find its limits. You have to be brutal with it – the steering is super heavy with more tyre on the road so you do have to shove it into the corner – but whatever I did on the drive home the car responded to eagerly and wanted more. I love it, and can’t wait to try it on dirt. …the tune on Wednesday night! Yep, tuning the Microtech and dialing in the cams on the dyno. No real expectations on power at this stage, I just want it to drive better and, most of all, be 100% safe. Then, late this week, my new Cusco 5-point half cage is arriving. It’s a non-sunroof model, so it’ll be an Easter job to mod the ceiling to get more headroom and space for the cage. THEN, in a week or 2, my new wheels are coming! Superlite GTR-light 15×8 -4, to which I will eventually be fitting Achilles 123s for use in tarmac events. They should send the grip levels off the planet. So, yeah, we’re definitely getting there! Once this cage is in I think it’ll finally be time for a full feature post on the little 86 that could. Stay tuned.